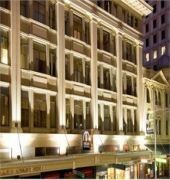 The Miller Apartments are superbly located just metres from Adelaide's renowned Rundle Mall. They offer stylish, fully self-contained accommodation and friendly service. Guests enjoy 100 MB or 2 hours of free WiFi. The Miller Apartments come with fully equipped kitchen, separate living area, broadband internet access, cable TV, writing desk and individually controlled air conditioning. There are continental breakfast packs in the apartments. Charge-back service at various restaurants nearby and delivery service are also available. The well-equipped gym and business centre are at your disposal and secure car parking is available on site. All the apartments are serviced daily and the reception is open 24/7.